I promise this post is tagged before Spoilers begin. Feel free knowing you are safe and will be warned! 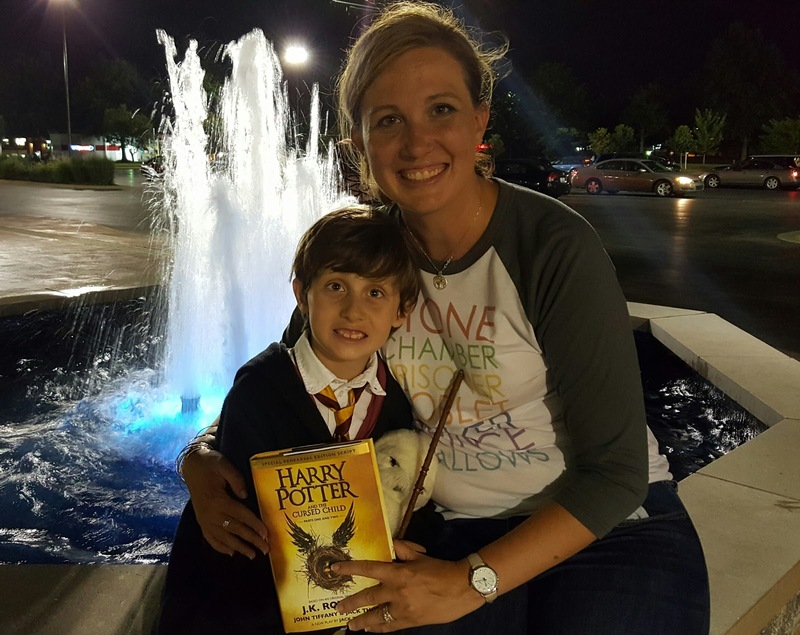 As Henry's love for Harry Potter has started to grow, actually no, scratch that, since the moment Henry was born, no wait... scratch that too. 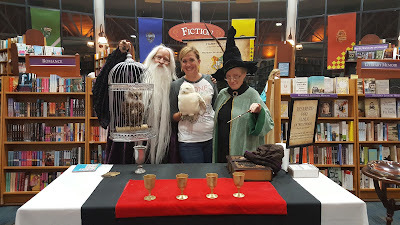 Since the moment I read the final Harry Potter book I realized that I just a little bit heartbroken that the days of midnight release parties were over. That my child, or future child, would never know the excitement of standing in line with hundreds of other die hard fans waiting for the clock to strike midnight and we rush through to pick up our beloved copy of the next Harry Potter book. 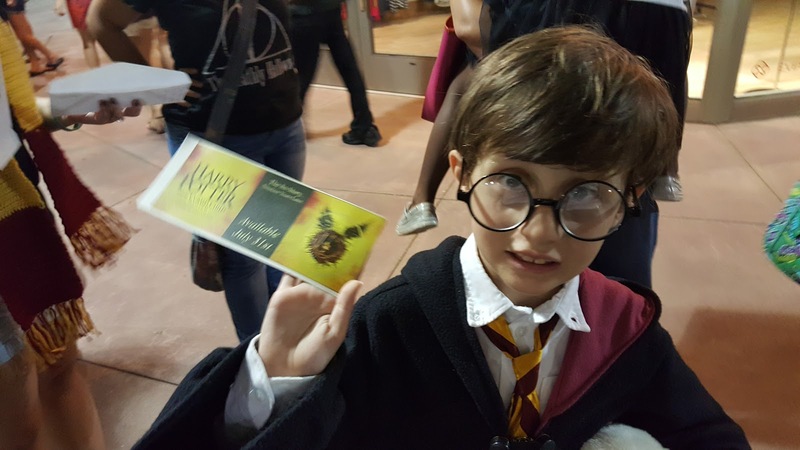 Stick to your ticket, Harry! 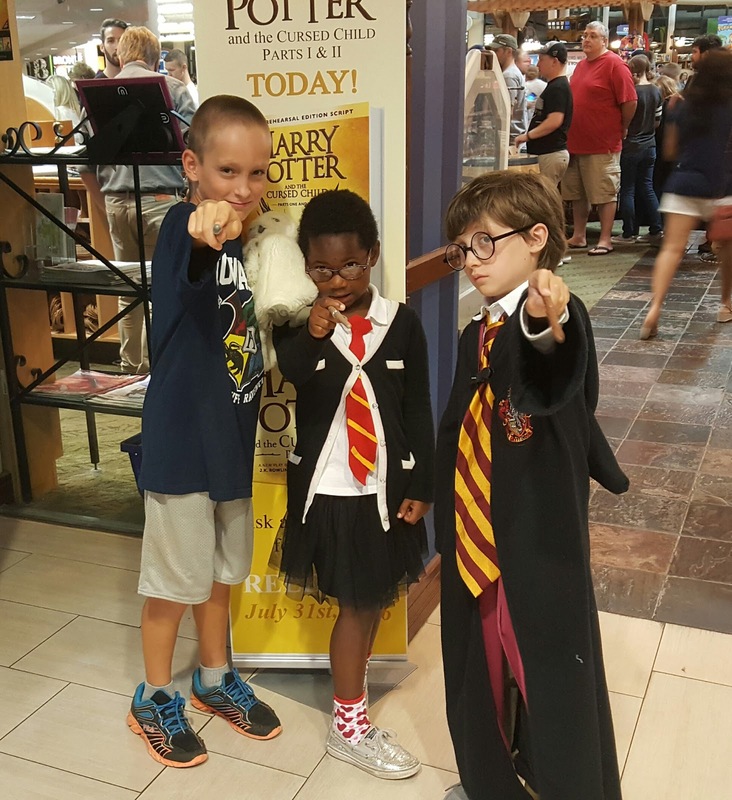 And then I heard that our local bookstore was having an old school midnight release party for the release of Harry Potter and the Cursed Child. And well... I just couldn't help myself. 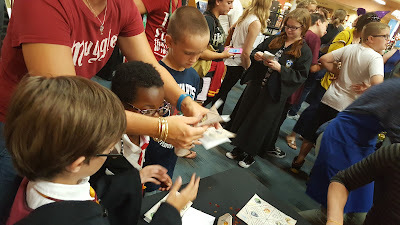 Even though Henry has only read book one (We worked on a spoiler alert alarm he would sound in the event that anyone tried to talk to him about future books!) and wouldn't be able to read the new book, I wanted him to experience the fun. And man, it was awesome. There were SO MANY PEOPLE. I am terrible at estimating numbers of people... was it hundreds? Thousands? I DON'T KNOW, but the bookstore posted a video of the line at midnight, and it's pretty impressive. They had wand making and house sorting, tons of people were in costume and you could meet these awesome individuals! He was, however totally into getting the new book! So we walked around and took it all in, played the the bouncy house, caught a TON of Pokemon (Worlds colide! ), and got in line. Right at midnight the crowd sang Happy Birthday to Harry, and I would say it was super cheesey, excpet, well, I was too busy trying to not like, cry or something. So, we got our book. Which he is dying to read. Once we got home I decided that no child should go to a midnight release party and not get to read at least the first few pages of a book they have been waiting to read. So, we broke out my old copy of Chamber of Secrets and read the first few pages. The joy and smile and giggles were absolutely magical. Overall, I really really loved it. I need to probably read it again, because it took me awhile to get into it completely, but once I relaxed and let myself enjoy it, I was once again pulled into the magic. I think it gets stronger as it moves forward, and man, at some points it touched my heart. Like, crying actual tears, touched my heart. I had avoided all spoilers and reviews, so I had no idea what was coming, and I am glad for that. I will say that it is a play, and so does not have the same depth as a classic JK Rowling book. And people will complain about that. At times it reads like fanfiction, which in a way it almost is, I guess. It has some issues I could pick apart and obsess over, I could let them take away from the story or even ruin the book, but I won't do that. For what this was, it was truly wonderful. It is a play expanding the world that I love, and I would love to see it on stage. But for now, I have to make due with the book, and it really was great to be back in the world. And now, the SPOILER FILLED REVIEW. Guys, this story. THIS STORY. Let's get right into it. First and foremost, I love Scorpius Malfoy to the ends of the earth. I absolutely love that this story gave heart to a beloved Slytherin (or two) and I loved that even Draco was given the character development I wished he had been given in the original series. 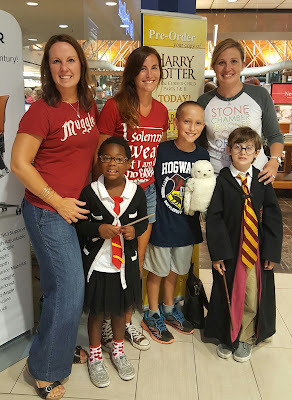 I am not a die hard Slytherin fan, but this story definitely helps to show that there are good people in all houses, and I loved that. I do wish we had characters in other houses, but again, I think this comes down to this being a play. The character and world development cannot be there on stage like it can in a book. And I can accept that. I also really liked Albus, in all of his flawed nature. I know people have complained about how Harry struggles with parenting Albus, and how it seems out of character, but I honestly disagree. 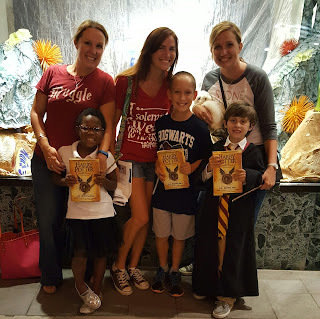 Sure, maybe some of the things are pushed farther than they would in a novel to make the points clear on stage, but I think we were given seven books with Harry as a flawed but wonderful character, and I think that continues throughout this book. Parenting is hard, knowing what to say is hard. And we have seen time and again where Harry has struggled to let the people closest to him know they are important, to make them feel special, to not try to take everything on his own shoulders. I do not think it is a far stretch of the imagination to see that these are struggles that could continue into parenting. I loved that Hermione and Ron were in love in all the timelines. I loved that when they weren't together, they were both worse off because of it. I felt it was a wonderful counter attack to all of those who dislike that they end of together. I was always in camp Ron/Hermione and I am really happy this story didn't undo that. Actually, I am really glad this story didn't undo anything. I felt that it added context, but it stayed true to the original text, and that is possibly why I can easily forgive it's other faults. It only added, it never took away. I am not sure how many times I thought "This is like a Harry Potter/Back to the Future mash up!" The use of the Timeturner is one of those things I had to let go of and just enjoy. I cannot get behind the idea that Cedric would ever (EVER) have been a death eater. I don't think it matched his character. I wish they had allowed Scorpius and Albus to be a couple. Not just to provide LGBT representation, but because they read like a couple. And maybe that's my love of Carry On talking, but man, I was all in for some gay wizards falling in love. I didn't KNOW I was in for that, but once the story started to develop I really hoped it was going to go that way. When it didn't, I felt an opportunity was missed to include much needed representation in the Wizarding World. I can't decide how I feel about Voldemort having a daughter with Beletrix. Like, I really can't decide. I am okay with it in the context of this story, but it is the one piece I struggle with in how it fits into the originals. I loved how Snape and Dumbledore were worked into the story.I thought it was the perfect amount for both. The part in the horrible future (Voldemort Day... ) where Ron and Hermione embrace their fate of the Dementors Kiss and choose to stay together to give Scorpius time to escape, ACTUAL FREAKING TEARS. I thought that entire section of the story, including Snape's fall, was probably the strongest of the entire book. As I read, I would take the magic and transformations for granted, because they were in my head, but again and again it would occur to me that this is written for a stage. And SERIOUSLY, I want to see that. And I guess that's it (for now). The more I think about it, the more I am happy with it. Does it have flaws, sure. Does it gloss over some things, yep. Does it feel like Harry Potter? YES IT TOTALLY DOES. Now I just need to know when the play is going to be available in the United States.